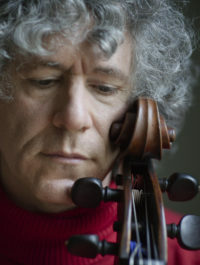 Acclaimed worldwide for his profound musicianship and technical mastery, British cellist Steven Isserlis enjoys a unique and distinguished career as a soloist, chamber musician, educator, author and broadcaster. As a concerto soloist he appears with many of the world’s leading orchestras and conductors, including the Berlin Philharmonic, National Symphony Orchestra Washington, London Philharmonic and Zurich Tonhalle orchestras. He gives recitals every season in major musical centres, and plays with many of the world’s foremost chamber orchestras, including the Deutsche Kammerphilharmonie Bremen and the Australian, Mahler, Norwegian, Scottish, Zurich and St Paul Chamber Orchestras, as well as period-instrument ensembles such as the Orchestra of the Age of Enlightenment and Philharmonia Baroque Orchestra. Unusually, he also directs chamber orchestras from the cello in classical programmes. Recent performing highlights include appearances with the Gewandhausorchester Leipzig, Vienna Philharmonic Orchestra at the Salzburg Mozartwoche; the US premiere of Thomas Adès’s Lieux retrouvés with the Los Angeles Philharmonic, following world and UK premieres in Lucerne and at the BBC Proms, and a further performance of the work in Amsterdam with the Britten Sinfonia, all conducted by the composer; Prokofiev’s Concerto Op. 58 with the London Philharmonic Orchestra under Vladimir Jurowski, in London and at the Dresden Music Festival; Haydn’s C major Concerto with the Orchestra of the Age of Enlightenment under Adam Fischer; and Shostakovich’s Cello Concerto No.1 on an Australian tour with the Australian Chamber Orchestra. As a chamber musician, he has curated series for many of the world’s most famous festivals and venues, including the Wigmore Hall, the 92nd St Y in New York, and the Edinburgh, Verbier and Salzburg Festivals. The 2018/19 season will see him present a series of four concerts at the Wigmore Hall celebrating the works of two musical visionaries to whom he feels particularly close: Gabriel Fauré and Robert Schumann. Other specially devised programmes have included ‘In the Shadow of War’, a major four-part series for the Wigmore Hall to mark the centenary of the First World War and the 75th anniversary of the Second World War; explorations of Czech music; the teacher-pupil line of Saint-Saëns, Fauré and Ravel; ‘Cello and Voice’, a unique series of three programmes exploring the affinity of the cello and the human voice; varied aspects of Robert Schumann’s life and music; and the music of Sergei Taneyev (teacher of Steven’s grandfather, Julius Isserlis) and his friends and students. For these concerts Steven is joined by a regular group of friends which includes the violinists Joshua Bell, Isabelle Faust, Pamela Frank, and Janine Jansen, violist Tabea Zimmermann, and pianists Jeremy Denk, Stephen Hough, Alexander Melnikov, Olli Mustonen, Connie Shih, and Dénes Várjon.He also takes a strong interest in authentic performance. Recent Hyperion releases include a recording of the Chopin Cello Sonata, Schubert’s Arpeggione sonata and other works by the two composers with Dénes Várjon, using an Érard piano of 1851. In recital, he gives frequent concerts with harpsichord and fortepiano. With harpsichordist Richard Egarr, he has performed and recorded the viola da gamba sonatas of J.S. Bach as well as sonatas by Handel and Scarlatti. Past seasons have featured a special performance with Sir Andras Schiff at the Beethovenhaus in Bonn, using Beethoven’s own cello; and recordings with Robert Levin of Beethoven’s complete music for cello and piano (selected for the Deutsche SchallplattenPreis), using original or replica fortepianos from the early nineteenth century, as well as performances of the cycle in London, New York, San Francisco, Norway and Tokyo. This season, Steven and Robert tour extensively in the US and Europe with Beethoven recitals, including performances of the whole cycle in Florence, Milan and Chicago. He is also a keen exponent of contemporary music and has premiered many new works including John Tavener’s The Protecting Veil (as well as several other pieces by Tavener), Thomas Adès’s Lieux retrouvés, Stephen Hough’s Sonata for Cello and Piano, Left Hand (Les Adieux), Wolfgang Rihm’s Concerto in One Movement, David Matthews’ Concerto in Azzurro, and For Steven and Hilary’s Jig by György Kurtág. In 2016, he gave the UK premiere of Olli Mustonen’s of Frei, aber einsam for solo cello at the Wigmore Hall. Writing and playing for children is another major enthusiasm. He has written the text for three musical stories for children – Little Red Violin, Goldiepegs and the Three Cellos, and Cindercella – with music by Oscar-winning composer Anne Dudley; these are published by Universal Edition in Vienna. He has also given many concerts for children, for several years presenting a regular series at the 92nd Street Y in New York. Steven Isserlis’ books for children about the lives of the great composers – Why Beethoven Threw the Stew and its sequel, Why Handel Waggled his Wig – are published by Faber and Faber, and have been translated into multiple languages. His latest book, a commentary on Schumann’s famous Advice for Young Musicians, was published by Faber and Faber in September 2016, and in the US by Chicago University Press in 2017. As an educator Steven Isserlis gives frequent masterclasses all around the world, and since 1997 he has been Artistic Director of the International Musicians’ Seminar at Prussia Cove in Cornwall, where his fellow-professors include Sir Andras Schiff, Thomas Adès and Ferenc Rados. He is also a regular participant, alongside Gidon Kremer, Christian Tetzlaff and Sir Andras Schiff, in the bi-annual series ‘Chamber Music Connects the World’ at the Kronberg Academy in Germany. As a writer and broadcaster, he contributes regularly to publications including Gramophone, The Daily Telegraph and The Guardian, has guest edited The Strad magazine, and makes regular appearances on BBC Radio including on the Today programme, Soul Music, as guest presenter of two editions of Saturday Classics, and as writer and presenter of a documentary about the life of Robert Schumann. Most recently for BBC Radio 4, he presented a documentary about his hero Harpo Marx – ‘Finding Harpo’s Voice’, described by The Guardian as “sheer charm … a winner”; and a conversation, ‘Only Artists’, with playwright and novelist Sebastian Barry, which The New Statesman reviewed as “perfect … strikingly and joyously something from an earlier time”. His diverse interests are reflected in an extensive and award-winning discography. His recording of the complete Solo Cello Suites by J.S. Bach for Hyperion met with the highest critical acclaim, and was Gramophone’s Instrumental Album of the Year and Critics’ Choice at the Classic BRITS. His latest recordings include the Brahms Double Concerto with Joshua Bell and the Academy of St Martin in the Fields, and – as director and soloist – concertos by Haydn and CPE Bach with the Deutsche Kammerphilharmonie Bremen, Grammy Nominee for Classical Instrumental Solo in 2017, winner of Limelight Magazine’s Orchestral Disc of the Year in Australia 2017, and shortlisted for a Gramophone Award in the Concerto category in 2018. A special First World War-inspired disc with Connie Shih was also released in 2017, including works performed on a travel cello – now known as “the Trench Cello” – played in the trenches by WWI soldier Harold Triggs. Other recent releases include the Elgar and Walton concertos, alongside works by Gustav and Imogen Holst, with the Philharmonia Orchestra and Paavo Järvi; Prokofiev and Shostakovich concertos with the Frankfurt Radio Symphony, also under Paavo Järvi; Dvořák’s Cello Concertos with the Mahler Chamber Orchestra and Daniel Harding; and recital discs with Stephen Hough, Thomas Adès and (for BIS) a Grammy-nominated album of sonatas by Martinů, as well as works by Mustonen and Sibelius, with Olli Mustonen. The recipient of many awards, Steven Isserlis’s honours include a CBE in recognition of his services to music, the Schumann Prize of the City of Zwickau, and the Piatigorsky Prize in the USA. He is also one of only two living cellists featured in Gramophone’s Hall of Fame. In 2017, he was awarded the Glashütte Original Music Festival Award in Dresden, the Wigmore Hall Gold Medal, and the Walter Willson Cobbett Medal for Services to Chamber Music.